Omegle Camera not working. If your camera is not working on Omegle, you can fix the Omegle camera not working error. Omegle is a popular Online Webcam site. It is extremely popular all over the world and almost users of every age group are the website lovers. How to get Happn Unlimited Charms. There might be two possible reasons if Camera is not working on Omegle. If your Web cam is faulty, you have to get a new one or you can ask the engineer to fix this. But if your camera hardware is perfectly fine, you can check for the below error. Adobe Flash player is needed to run the videos or check for the online streaming. This is a must have tool for running Omegle. Let us now check how the error can be fixed. For further analysis, i am considering your hardware is not a problem. If camera is working on other application but not working only on Omegle, you can identify that the reason is because of the Flash Player. If it is not working anywhere please reinstall the camera driver and then proceed. First Open your browser and go to https://get.adobe.com/flashplayer/ and download the flashplayer file. Close all your browser windows now. Clear your Web history and reopen the browser. Go to Omegle and you will be able to use your Camera on Omegle. Omegle is one of the top cam dating sites popular in the globe. Mostly the youngsters get addicted to the interface. If you are going to use this, you might encounter many idiots and useless people who just will show intolerant content. You should ignore that. Sometimes, it might happen that The other guy on webcam is displaying you some black screen and you might assume that this is the issu with your computer. You should confirm around 5-6 other random chats and then go for the conclusion. Fix Hotstar not working on Jio. It might happen that even after the latest flash player and the browser you might not see the screen display. In that case, i recommend you to use the camera in other apps. 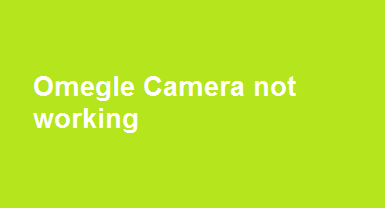 If there also, it is not working it might be the issue with the camera itself. I am again soecifically telling this because many a times the readers just try the camera in browser itself but on some other website. It might be the issuewith the broawer settings as well. Yes, why not. This is possible that you might not be able to see the camera face because the omegle server is having the issues. But the probability for this is very less. You can not directly blame the server if omegle camera not working. Thats why i sugges ed you to proceed in a way that if all the above steps are fine for you then it is surely a problem with the omegle server. In that case, you will also notice thatthe other person is also not visible on the website. Actually, this point goes differently for different reasons. If the hardware is faulty then you can either get it replaced with a new one or you can repair the device. The cost for this will vary from place to place so i can not give this input. But the cost for hardware fault will not be a huge one. But if you need to update the flash player then there is no cost foto the same. You can fix the error if omegle camera is not working on your windows 7 , windows 8 , 10 , 9, xp or even mac OS. The Flash player is free to install. You should get the flash player from official site and should not go to unofficial links to get this flash player. This will surely solve the problem. You can drop down the comments below if you have further questions.